The KOBAS team is putting the finishing touches on a powerful new way to manage your EPoS pricing. 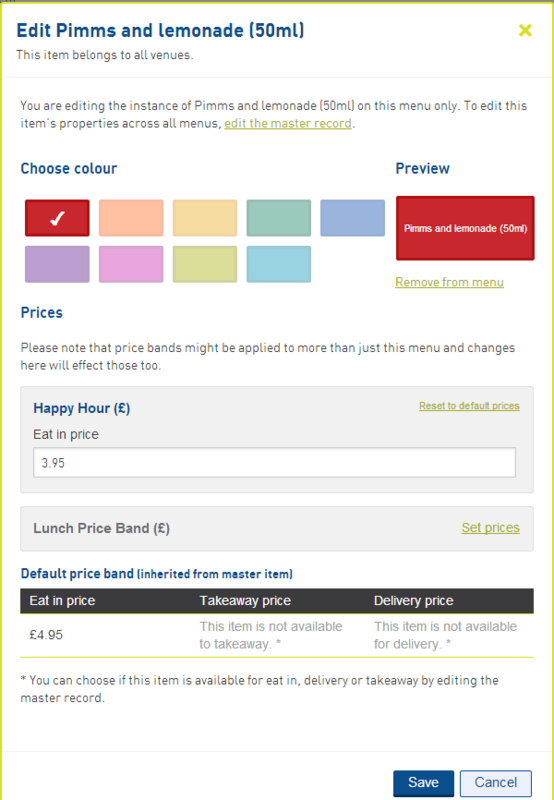 Our latest improvement is driven by the need to associate more than one price with an item on any menu or in any venue. Then KOBAS will let you automatically change that price based on any number of factors, such as time of day or a customer’s loyalty value. In doing so we’ve introduced a huge number of possibilities to help multiple venue operators control their sales. Whether you want the same menu with different prices in different sites, or different menus with unified price bands across all sites, KOBAS EPoS does it all. The EPoS item manager is where you register the drinks, snacks, food dishes and any sundries you wish to sell. You can tell KOBAS exactly what the ingredient composition of each item is, which means we can track theoretical ingredient consumption and analyse your gross profit on each item. Established customers will note that we’ve removed the default style, page and position attributes from the item manager. These are now all set on the individual menus. Price Bands behave like a mask over default item prices. Maybe you want to offer cheaper lunches during the week, and cheaper drinks in the early evening. You could create Price Bands for these and amend only the prices of the items you want to vary; you wouldn’t need to laboriously copy any other prices across. You could then set up these Price Bands to take effect at the times of the week that suit you. Once you’ve finished setting everything up in KOBAS Cloud, log on to your EPoS, download data and hey presto! KOBAS EPoS will manage all price changes for you, while tracking ingredient usage for analysis in the background.